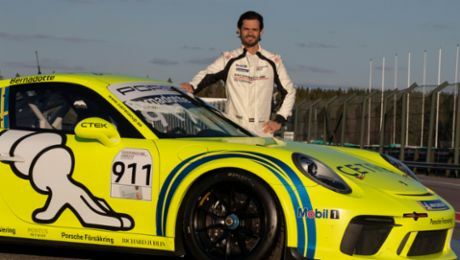 At the ninth round of this year’s VLN Long Distance Championship Nürburgring, the Porsche factory drivers Nick Tandy (Great Britain) and Frédéric Makowiecki (France) ran amongst the front runners from the start and concluded the four-hour race in Germany’s Eifel region 3rd overall. 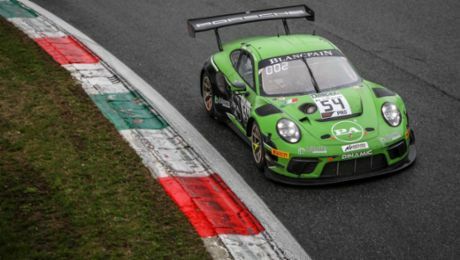 The new customer sport racing car for GT3 race series worldwide features an improved aerodynamic efficiency compared to its winning predecessor, as well as improved driveability and further optimised safety. The over 368 kW (500 hp) GT racer will be sold to customer teams for 429,000 euros plus country-specific value added tax. The engine that was run at the tests on the Nürburgring was the well-proven power plant of the predecessor model. The new direct fuel injection engine generation is currently undergoing test bench runs in Weissach and further testing in the USA. “The first test outing of our new 911 GT3 R was promising,” says Head of Porsche Motorsport Dr. Frank-Steffen Walliser. “Pure performance was not the only priority today. We are also looking at being able to offer our customers a reliable car that runs well in all conditions. The Nürburgring Nordschleife is excellently suited to put the chassis, body and systems under a stress test. And this works best under race conditions."